Hi, my name is Johney and I live in Elk Grove(Sacramento)Ca. I have a new track I just built, it is a scale 64/100, 1000ft track with 15'6.25"being the timed section on a 20'5" total length set up. It is a plastic AW track which is 4 lanes wide. 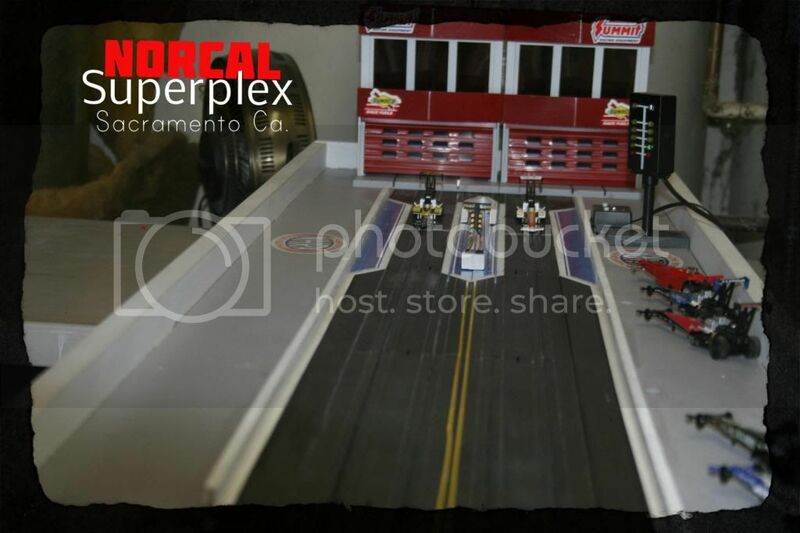 I run the cars on the outer most lanes which looks more realistic, I am using for now, 2 afx wall warts, and AW cheap controllers, my track is built in 3 sections to be portable and the setup is 17 inches wide. I am planning on adding another 8" section for the shut down area that would give me a total of 29" of track including around 11' of shut down. And as for lighting i am using three 4' long florecesent lights that are hanging from the ceiling, mounted right above the track and they work just fine with no problems at all. I have an Astron 15 Amp/40 Volt power supply with variable adjustments and 2 parma controllers which I will use when I hard wire my appropriate track sections. and the parma controllers use allagator clip mounts. Im contemplating buying a second power supply so that i could control each lane indivisually. I am currently using the SlotDragon timing system, it works pretty good, but when funds allow I will upgrade to the Trackmate trackpro2000 system. 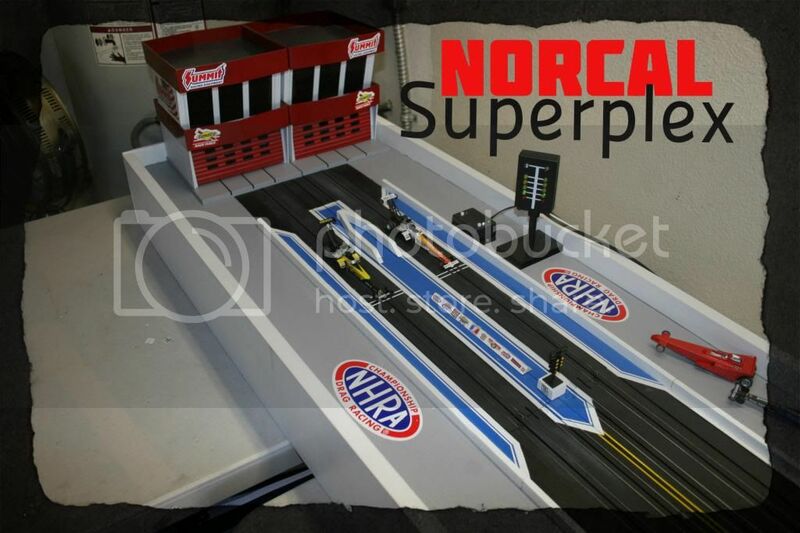 I haven't named the track yet, but im leaning towards NORCAL Superplex, which i feel is appropriate since I also have a 61' 4 lane HO. Road course mounted on a 6'x12' layout using the same Astron power sourse. 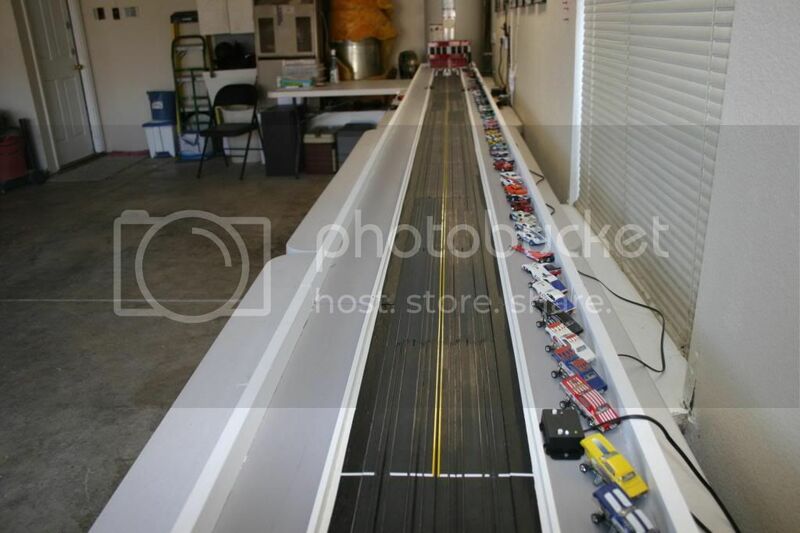 I'm also using a computer timing system for my road course along with my Astron power supply and lots of other stuff, which is from Gregory Braun's, HO slotcar racing web site. ( he has Great stuff). That is a very good look. Start line detail is awesome. Great execution. 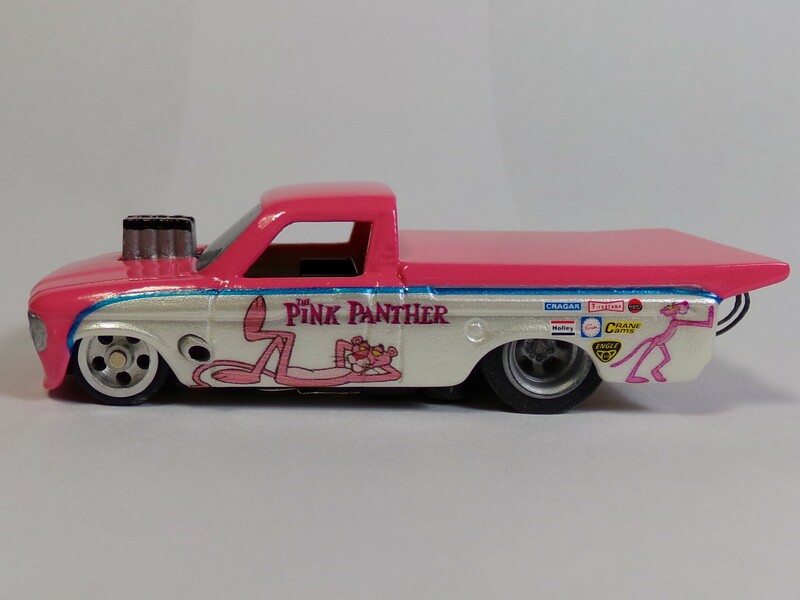 Thanks for Your comments, its my first attempt at building a Dragstrip. I still need to hook up my Astron power supply (it has variable settings) and drill the mounts for my parma controlers,( so that I could get rid of the cheap wall warts and stock controllers that im currently using. Ya think I should use 2 power supplies? because I can adjust each lane indivisually that way. It seems most of the time my right lane seems just a little bit faster, I figured that seperate power supplies would even the lanes, any comments? Also Im looking for some photos of fans in grandstands, just like the ones on the background of this site, I would like to make some grandstands in the same manor for my track. Any help would be apreciated, thanks. nice job and I like the 4 lane set to space the two lanes apart.